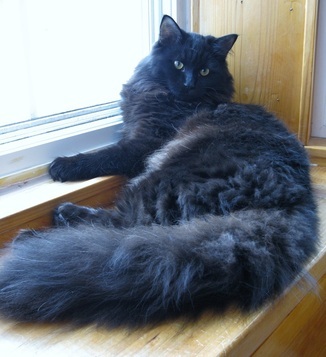 Sullivan Night in Shining Amore "Romeo"
Our Romeo boy is a shiny solid black with super soft silky fur. He joins us from Idaho, and is the great-grandson of Liam and our first girl Daphne! Romeo is a busy boy, and loves rocketing around the house and chasing anything that moves. When he's finished playing, he seeks a warm lap to curl up in. Thank you to Andrea for our handsome, friendly boy! Adelie is the daughter of Tia and Liam, from our Birds of a Feather litter. She is a black tortoiseshell. 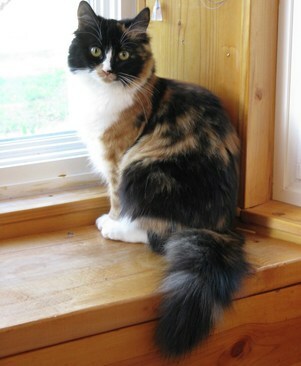 Adelie is very sweet and affectionate, and frequently enjoys snuggling with her human and feline family members. 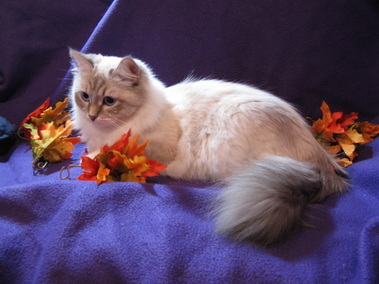 Adelie is a playful girl, fascinated by water, and she has a wonderful rumbling purr that we hear often. Zuzu is another daughter of Tia and Liam, from our Wonderful Life litter. She is a spunky little girl, and can often be found tearing around the house. After a full schedule of jump, pounce, and chase, she loves cuddling with us. Zuzu is a seal tortoiseshell point, so she will bring us blue eyed kitties in several colors when she is old enough to be a mom. The following cats have been retired from breeding and are now living lives of leisure. It is very difficult to send our adults to new families as they have been part of our family for several years and we love them! But it is best for their health and happiness, so we shed some tears and keep in touch with their new families, and in some cases they live close enough that we can visit them. We did keep one of our male cats, Bogie, as a companion for us and our breeding cats. A beautiful blue-cream tortoiseshell, Tia is very sweet and friendly! She loves to cuddle with us, and she is very playful; Tia especially enjoys feather toys! A typical Siberian, Tia frequently offers to "assist" with jobs around the house, and she loves birdwatching in sunny windows. She is enjoying her retirement with her new family. Caitriona came to us from Colorado. She is a brown torbie with white. Cait is so gentle and happy! We enjoy her playful antics and pleased purr. Cait especially enjoys "helping" make beds in the morning, and she loves to play fetch!! Her new family lives nearby and she will enjoy many years of happy retirement. Pavel ("Liam") joined our family from Montreal Canada. He is a stunning solid black with bright green eyes and a wonderful purr! Liam is very playful, smart, and affectionate. He loves to snuggle! Liam is enjoying his retirement with his new family, sleeping on beds and sofas and climbing his very own cat walk. He lives nearby so we can visit him now and then. Finlay is now called Merlin! He is friends with his new two footed and four pawed family members in Wisconsin. We miss our cheerful, friendly furry boy and wish him many healthy happy years in his new home. Bogie is our very own boy, son of Tia and Liam. He is an extremely rare male tortoiseshell point! Almost all tortie cats, who have both red and black colors, are female. It is thought that male torties are sterile, but our Bogie proved this to be untrue when he sired one beautiful litter of four kittens! Bogie is now retired and shares our home as a friend and companion to us and our breeding cats and their kittens. Daphne is enjoying her retirement with a family where she continues to rule the roost. She is as gentle and sweet as ever, and now spends her days napping in the sunshine, bird watching, and taking walks in harness and leash. We visit her from time to time, and miss her dearly. Sophie is a gorgeous blue lynx point Siberian. 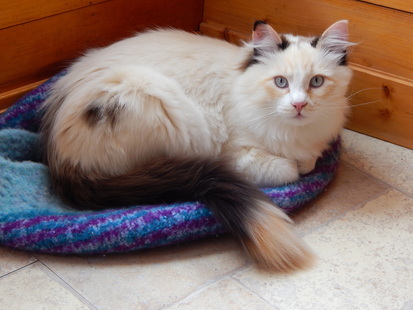 She is also very shy, and more comfortable with other cats than people. We made the difficult decision to sell her to a larger cattery, where she is mom to beautiful kittens at Daisley Siberians in Oregon. Purring is an automatic safety device for dealing with happiness overflow.